The photographs on this web-site are from the forthcoming book, "BENEATH LOS ANGELES: Southern California's Graves of the Famous, the Infamous, and the Just Plain Dead." Until the book is published, please enjoy these unique memorials found around the greater Los Angeles area. People come to L.A. from all over. The only folks who were born here will tell you it's not the same as it used to be, and they're leaving. In L.A. everybody's always coming or going. Except the dead. They're the only permanent residents here. This is their home page. For you, it is not too late; check out some final expense insurance. Not Just On The Internet Anymore! 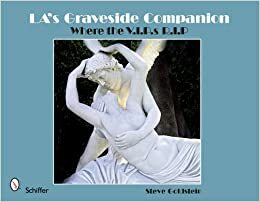 That's right- you can now peruse the final resting places of all your favorite Los Angeles residents anytime and anyplace.... because now Beneath Los Angeles is in a book published by Schiffer Books! With more photos, and more in-depth stories about the city and its history, Steve Goldstein's "LA's Graveside Companion" is an indispensable companion to this website. Order yours here today! Or if words and sentences are just a bit too pesky for you, there is no need to wait for the movie any longer. The once and future director (and brother to Steve) Ken Goldstein has translated the graves to a slim silver disk that just needs to be slid into your computer or DVD player. You will also have to manually press the play button (probably). Link here for a preview of this video (MOV format). Order yours here today! And Get Some Fun Stuff At The Same Time! Beneath Los Angeles is © 1997-2011 by Steve Goldstein & Ken Goldstein. All photographs are property of Steve Goldstein.